Photo By: Balber Architecture, Inc. 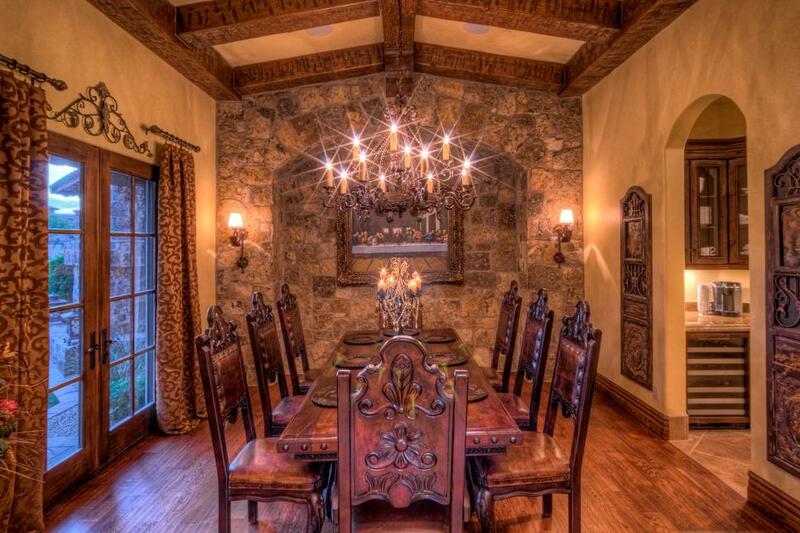 This grand castle-inspired home incorporates Gothic style elements in each room. 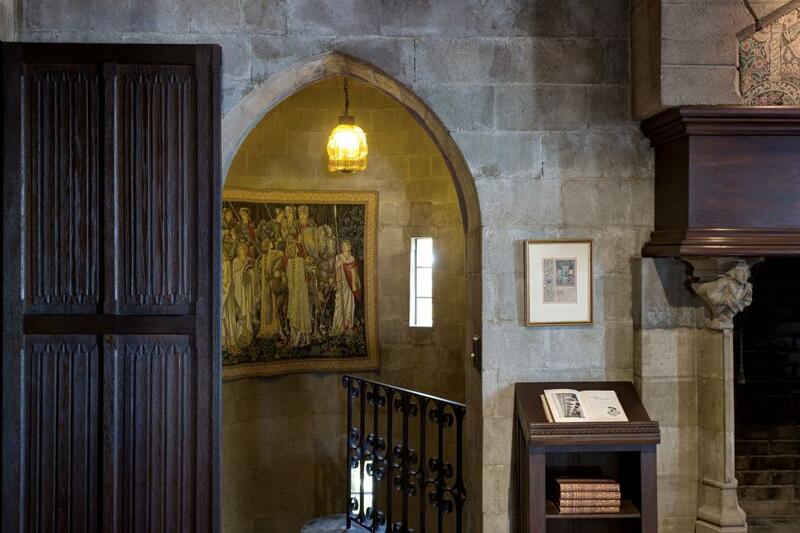 Wood accents contrast with the stone wall, while the entry way to this room boasts traditional medieval arches and ornate railings. 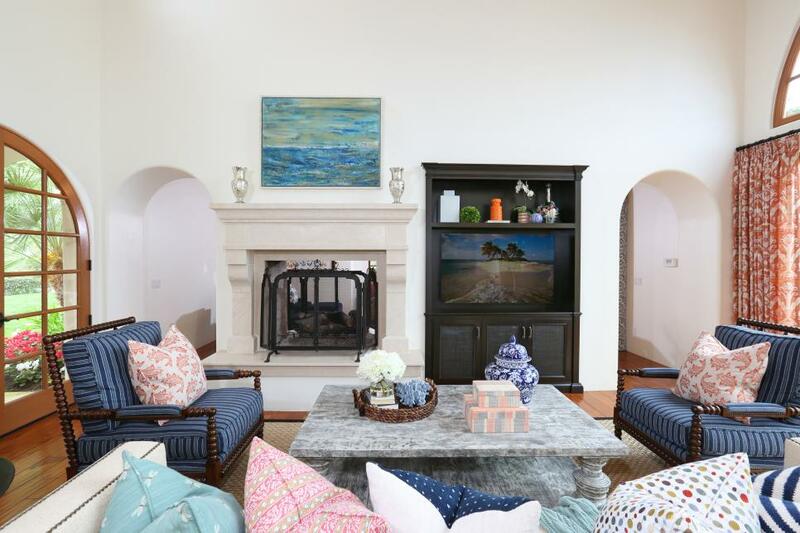 Although this home has spaces large enough for over 100 people to accommodate the homeowners' love for throwing parties, they wanted to maintain smaller, more intimate spaces for family gatherings such as this lovely living room with plenty of comfortable seating and a fireplace for warmth. This handsome dining room is a great example of the home's mix of textures with its wide plank wood floors, hand hewn beams in the ceiling and rustic stone accent wall. Detailed carvings give a unique touch to the chairs. 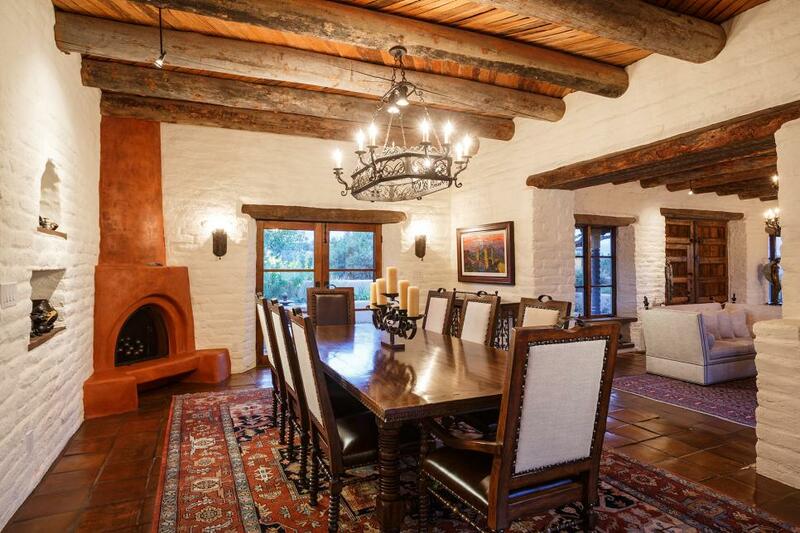 This Spanish Colonial dining room features a cast iron chandelier, carved wood table and adobe brick walls painted white. 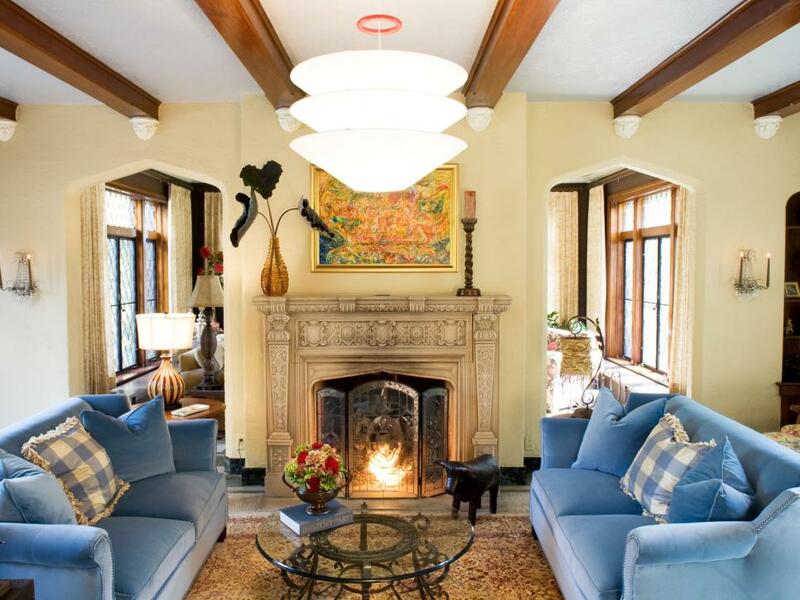 The corner fireplace adds cozy ambiance. The elegance of this entertaining area—a wet bar connects to a comfortable lounge—befits an Italian villa with cathedral ceilings, thick wood beams and a floor-to-ceiling cast stone fireplace. A glass enclosed kitchen and dining room offers the feel of the outdoors with the comforts of being inside. 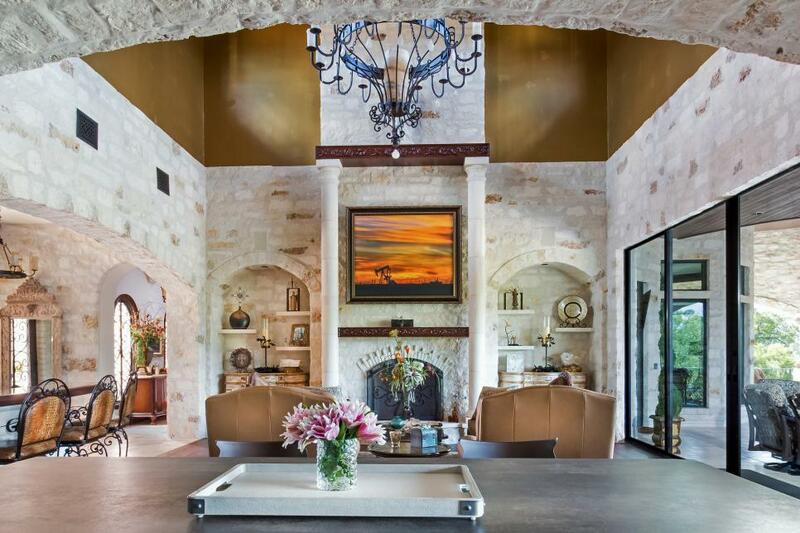 An arched stone entry bridges the living room and kitchen in this Tuscan-inspired home in Austin, Texas. In the living room, a beamed ceiling and warm wood finishes give a nod to Mediterranean design, while a wall of glass offers sweeping views of the outdoors. 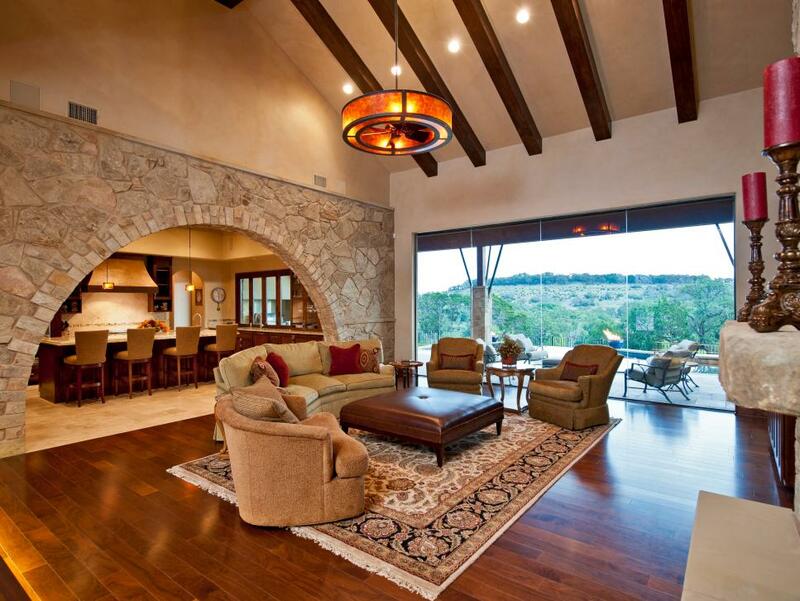 The stone fireplace ties in the with both the accent wall and the home's exterior. Living room flows to family/game room flows to dining room and on to the kitchen in the easy open plan layout of the home's first floor. Large windows all around fill the interiors with pretty natural light that reflects warmly off the terra cotta floors. 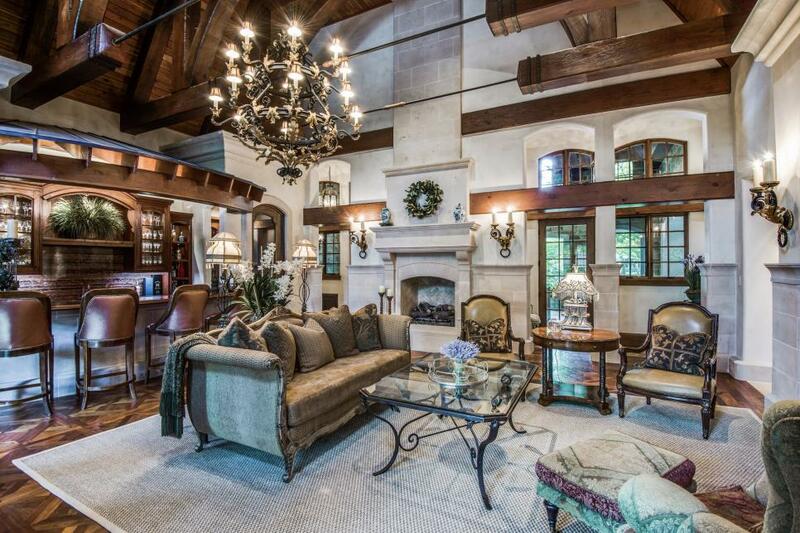 The ceiling of this huge living room floats up and away, two stories high. The height helps to balance out the heavy materials (wrought iron, stone) without diminishing the room's elegance. 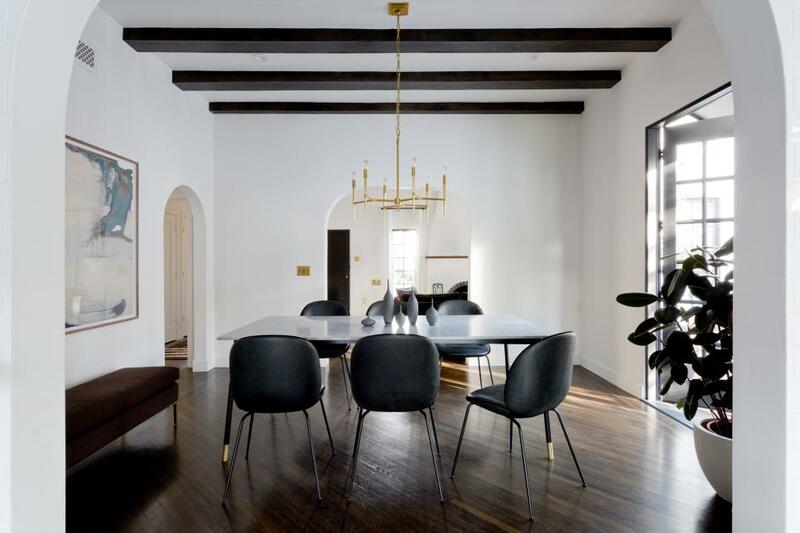 Keeping the furnishings simple in this dining room calls attention to the lovely Spanish-style architecture with its graceful arches, high ceiling and beautiful wood floors. Black exposed beams pull the eye up and make the ceiling appear even loftier. Classic Old World style elements fill this living room: ornate mantel, exposed-beam ceiling, traditional area rug and arched doorways. The end result is anything but outdated thanks to a cheery pair of blue sofas and stylish pendant light. A merry mix of patterned accent pillows adds life and color to the living room. 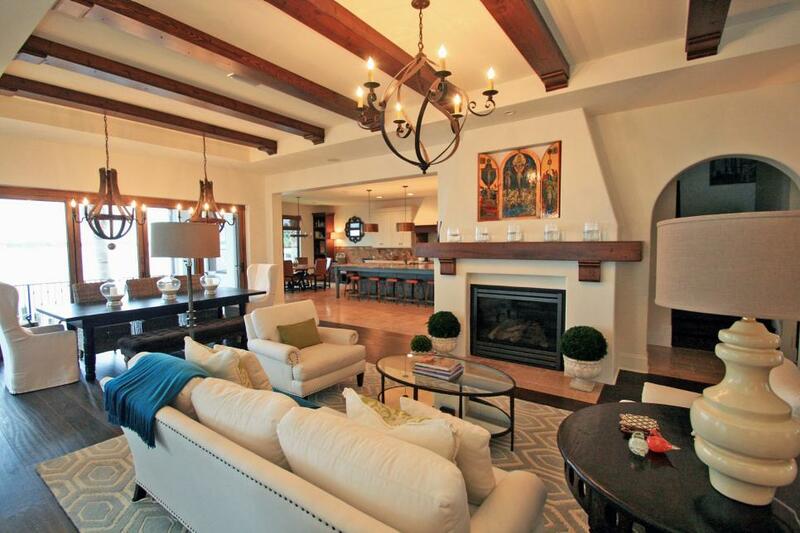 The wall between two arched doorways is balanced by a fireplace and an entertainment center. A contemporary dining table and all-weather chairs combine to create outdoor seating that's chic and durable. 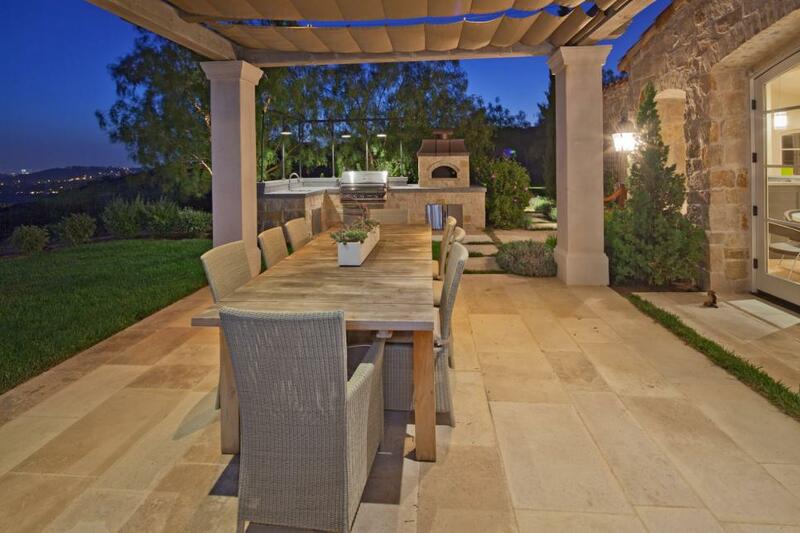 Exterior lighting sets the mood for outdoor entertaining at night. 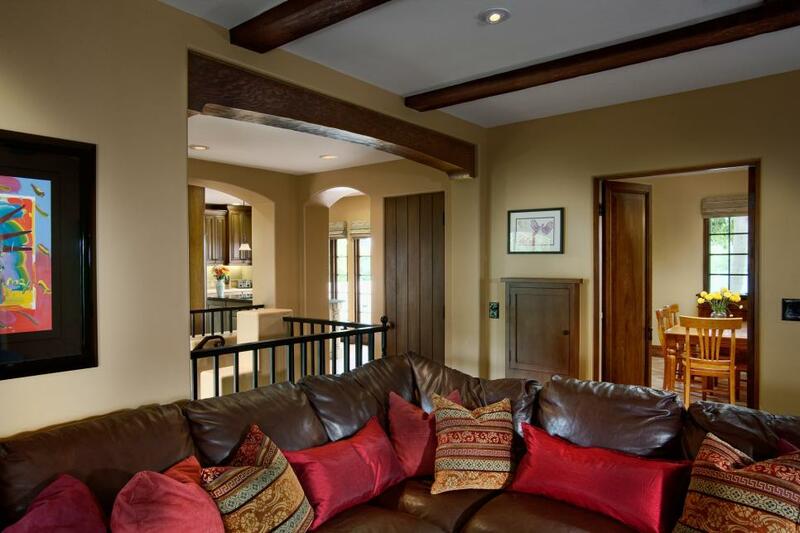 Close to the kitchen and breakfast room, this living space is a great place to relax with friends and family. A plush, leather sectional with bright red accent pillows offers a comfy spot to sit and enjoy a movie. 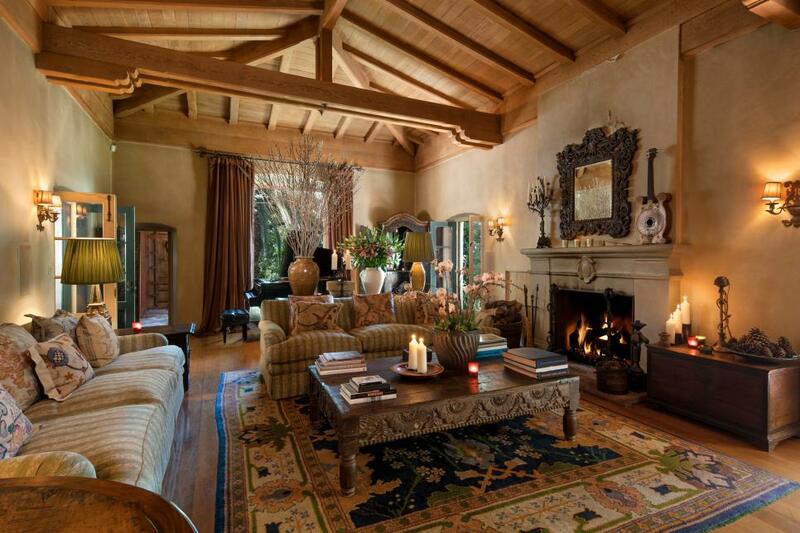 This warm and intimate living room includes a gorgeous wood paneled ceiling and cozy fireplace. This family room showcases an oversized built-in bookcase, which also serves as a media cabinet. Its chocolate brown hue coordinates with the furnishings, giving the space a custom look. A wall of windows floods the room with natural light. Protected from the elements, the covered veranda is a festive location for year-round gatherings. 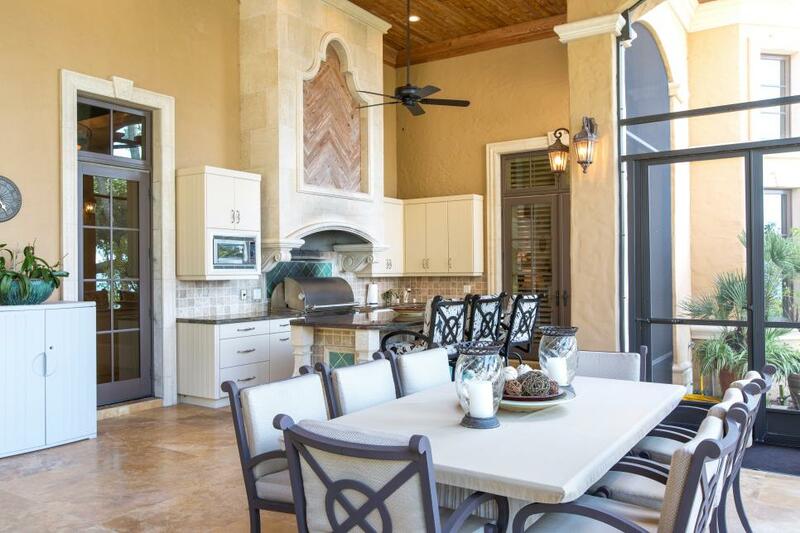 Enjoy alfresco meals at the large dining table overlooking the lagoon. The homeowners wanted a quiet place to read and listen to music. 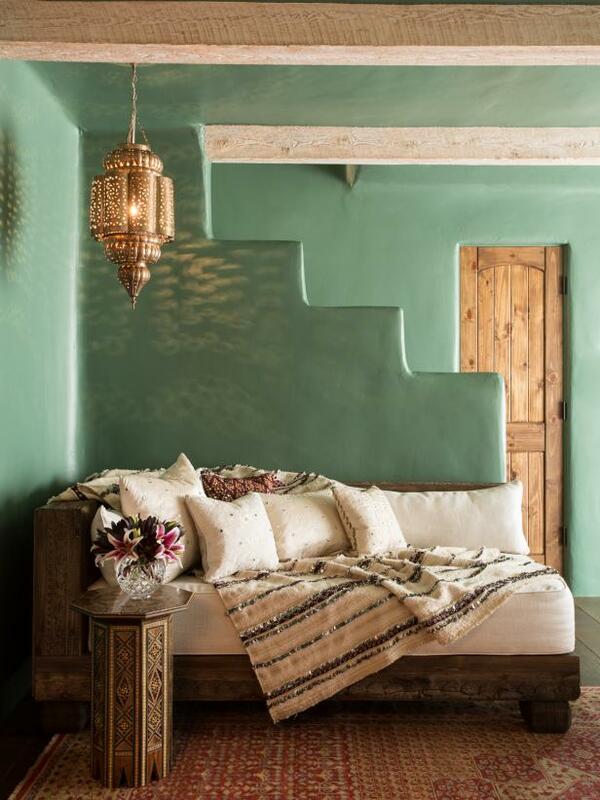 The serene blue-green walls do the trick nicely, combined with a custom-made chaise lounge with antique Indian carvings, an antique Moroccan wedding shawl and other Mediterranean textiles.